He’s been on the hunt for a good cup of coffee since he first traveled from Russia to the United States in 1989. More than two decades later, Yakov Tseitlin has found it; and has opened Cafe Moka to share a cup with the Lynn community. Cafe Moka opened April 14 in Central Square at the former location of Turbine Wine Bar. The cafe is owned by Tseitlin and his wife Linda, who also own Free Wind Travel and Red Rock Insurance, and have been working in Central Square for 20 years. 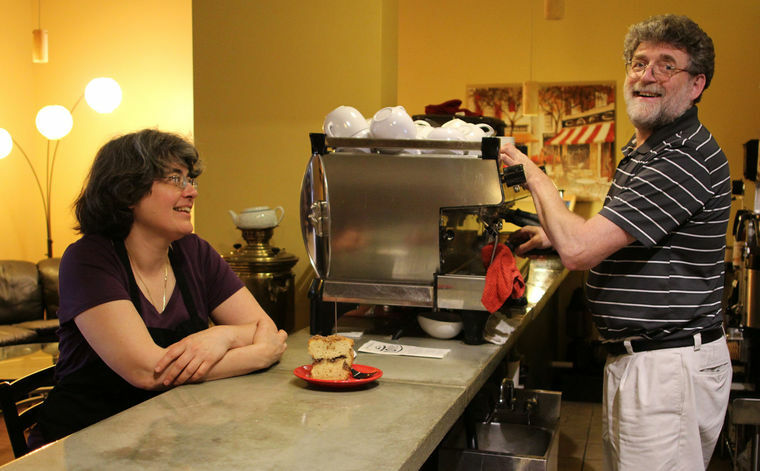 Linda and Yakov Tseitlin own Cafe Moka in Central Square in Lynn. But Tseitlin could never find good local coffee. His clients would travel to Salem and Beverly, but Tseitlin felt that was too far. Meanwhile, other coffee shops opened, but their coffee didn’t measure up to Tseitlin’s standards. So the couple decided to provide the coffee themselves. So the Tseitlins found a small roasting company in Salem to pick out the perfect blend of beans and roasting conditions for their signature blend. They buy coffee once a week, so they serve only coffee that has been roasted within, at most, 10 days, Tseitlin said. But a coffee shop is more than a place to get a quick cup of Joe. And that’s where Linda — who notably drinks only herbal tea — comes in. “My job is to look out that the food, service and ambiance measure up to the standards of the coffee,” Linda Tseitlin said. The Tseitlins wanted to create a downtown destination where business people could meet and network, friends would gather, and where individuals could relax with a tea and a good book. While Lynn has several restaurants, they tend to be very exclusive, Linda Tseitlin said. Several restaurants are too expensive for the average resident to visit for a daily meal; while the small ethnic restaurants are more affordable but primarily offer take-out food and cater to specific ethnicities. So Cafe Moka has tables for two and tables of eight. There are couches and free Internet is available, but talking is encouraged as well. There is no television. The city is encouraging the Tseitlins to apply for a license to serve beer and wine, which Linda Tseitlin said they are interested in getting. Yakov Tseitlin loves jazz and said he would love to have a jazz night for musicians to come and jam. Linda Tseitlin is interested in holding networking nights for professional women. But the more immediate goal is to just provide more of the moments the Tseitlins treasure. But downtown resident and neighborhood activist Seth Albaum said he expects Cafe Moka to become an integral part of the downtown life, especially if it extends its hours into the evenings.